Microsoft Project is a versatile platform intended for PPM (Project Portfolio Management). It comes bundled with on-premise and cloud-based options. The pre-installed planning tools assist users to organize and be updated with their projects, project direction, and day-to-day operations. The tool makes it possible for businesses to jump start and organize PPMs, and successfully impart their core business value. It allows businesses to have a visually appealing and improved approach in organizing their current programs and projects. 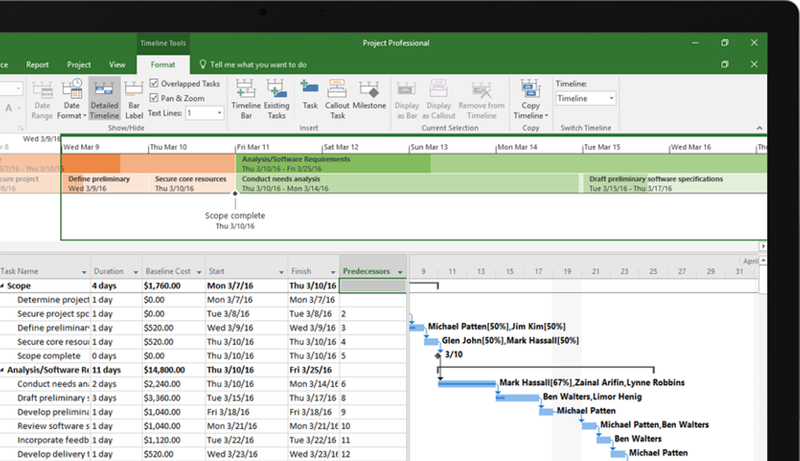 Whether it's catering to critical deadlines, picking proper resources, or inspiring teams, Microsoft Project provides a newer and highly intuitive experience that can help users plan out, organize, and work with groups, individuals, and the entire organization. The software comes with pre-installed templates, scheduling tools, and desktop PC/mobile device accessibility. Microsoft Project contains three primary modules. These are the: project management module, the portfolio management module, and resource management module. The portfolio management module lets users prioritize projects and tasks according to importance or other set rules. The resource management module helps users gain complete visibility on resources being shared. Teams can receive real-time data updates anywhere and anytime. Lastly, resources that remain idle are reduced dramatically utilizing the resource management module. The tool gives users complete visibility even if they’re dealing with more than a project. It boasts scheduling tools such as Gantt charts and pull-down menus for simpler and quicker project planning. The software’s multi-timeline gives a bird’s eye view on tasks and projects as well as their progress. Timelines can easily be delegated to a certain data and shared with project stakeholders. Microsoft Project offers accessibility to both mobile devices and desktop PCs. This allows for quick viewing of project data regardless of location. The software can connect to a plethora of Microsoft apps. It effectively uses Skype to improve communication. It functions with Office 365 so it can seamlessly work with other Microsoft apps such as PowerPoint, Excel, and Word. The tool works well with Power BI Pro to contribute to business intelligence analytics. Pre-installed templates can be customized according to user specs. It’s an approach that can jump-start any project quickly. Microsoft Project can help users include new tasks or make project revisions anytime without any hassle. The tool is highly intuitive and provides a nice mixture of usability and functionality.